I’ve always loved experimenting with different hair- styles and colours, but for a couple of years I’ve stuck to my own colour, ‘cause I had my doubts about the standard chemical ways of colouring. I recently met Dianne te Mebel, director and owner of the Instituut Haar & Gezondheid (Institute for Hair & Health) in Amsterdam. The Instituut Haar & Gezondheid is one of few salons in Amsterdam and even The Netherlands, which aims to use as much natural products as possible and integrate this in anything they do. Ever since Diane was young, she has a passion for nature, which she decided to incorporate into her profession. She developed herself as an expert in natural and plant based hair colouring. I’ve always thought that to colour my dark hair, the only way was de- colouring with ammoniac and then dying with chemical colours. Dianne dared me to test otherwise. She said that not only she could naturally add a hint of colour to my hair, but also promised to revitalise and regenerate my hair, to give it a “healing” treatment to prepare myself for winter. 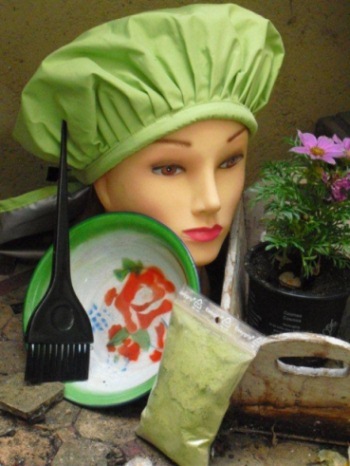 Perhaps, just like me, you don’t know too much about natural and plant based hair colouring? The ladies of the Instituut Haar & Gezondheid, definitely know their field of work and took their time to make me feel comfortable and inform me about anything I was interested in and more. So.. well.. then what is natural and plant based hair colouring exactly? The base is henna. Henna is a plant (a shrub actually, called Lawsonia Inermis, more info HERE ), with leaves that contain a tannin dye molecule. This molecule is called Lawson, and is released when the leaves are pulverised, acidified and made into a paste. This paste can be applied to hair (or skin), to give it a deep, reddish brown stain, because it binds to keratin (that’s what the outer layer of our skin and hair is made of). The colours added to the henna, are extracted from parts of amongst others flowers, trees, and plants that are dried and pulvarised until powder. For example coffee, onion peel, blue wood, cinnamon, hazelnut, rhubarb, salvia, tea, marigold, grains, elderberries and birch bark are commonly used. Before the colouring- process, the hair is first washed with a mild shampoo to open the hair scales (yes, just like the ones a fish has..), so the pigment can go in between. In my case the hair was washed with a shampoo of Pure Pact (Over HERE you can read my introduction to Pure Pact). When the hair is dried, the hair scales close and keep the pigment inside. The colour will stay in the hair for about 6 to 8 weeks. By washing the colouring, it will slowly get more vague, here for there will not be any visible outgrow like with chemical hair colouring. Natural hair colouring does not change the colour of your hair, so being a brunette and becoming a blonde, is not possible (but if your hair is grey, you can become a blonde again with the help of marigold!). If you have some grey hairs, as effect of the colouring you’ll get highlights instead. Plant based hair colouring is transparent, it forms a layer around the hair instead of penetrating it. You will keep your own hair colour with a nuance in the colour. From solely natural resources, 40 nuances are possible. By repeating the process of colouring regularly, the colour will become deeper and more intense. Dianne loves nature and the environment. While working in her hair salon, she realised that even if she was using natural products, in the process of colouring the hair was being packed with tin foil, which was trashed after use. It’s necessary to keep the hair warm after one applies the colouring, so it attaches better to the hair. This caused Dianne to think about a more sustainable way for this process, after which she invented and developed the sustainable heat cap for colouring. With this cap she got nominated for Duurzame Dinsdag 2011, where the countries’ best sustainable ideas are put in a suitcase and offered to the cabinet in order to create more awareness. All over the world there are millions of women that colour their hair. Many of them do this themselves, at home. Natural and plant based hair colouring is completely safe and simple when you have the right ingredients and tools, so Dianne did a lot of research, imported products and developed a starting package to make it possible for you to create your own natural hair colouring and dye your hair in the comfort of your own home. The package comes in 15 different nuances, but you can also get in touch with her to create a colour combination of your choice, or pass by the Instituut Haar & Gezondheid to get advised, ask questions and pick up a personalised package. Over HERE you can order the package. A starting package costs € 47.50,– (exclusive €2.30,– for delivery in The Netherlands) and consists of; a bag of colouring, a sustainable heat cap, and enamel bowl, a wide paintbrush, a twine of cotton wool and a manual. The package fits through your mailbox. When I visited the salon, the ladies made me a personalised mix of auburn, mahogany and henna colore. The nuances in my hair are mostly visible outside in daylight. Indoors, besides the exception of a very attentive individual, it’s only myself who notices the colour difference. BUT, even after having seriously neglected my split ends, a summer of sea and sun, living in a city with plenty of exhausts, as well as having often coloured my hair chemically in the past, my hair is obviously revitalised. It’s voluminous, it’s shiny, it feels soft and it looks healthy. I LOVE IT! I’m already looking forward to my next treatment and curious to how my hair will be when the colouring gets more intense and deeper! Have you ever coloured your hair? Are you conscious about what hair and beauty products you use? Are you aware that natural products are better for you than chemical based products? Previous Previous post: The Netherlands’ most pure restaurant; Natuurlijk. Hi….it’s good to know you’re going the natural way. The henna that you’ve mentioned is is used quite often in some Asian and middle-eastern countries to draw patterns on hands and feet for decorational purposes. It is also used by older people to cover their greys…so you’ll find a lot of elderly people with flaming oranges and reds! And thanks for visiting my blog…keep coming! Thank you! You found yourself a follower in me, I think your blog is a perfect start for me to start studying some basics of (parts of) Indian cooking. Keep it up!